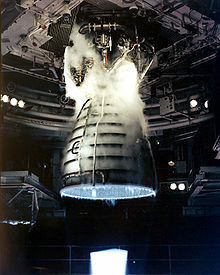 A remote camera captures a close-up view of a Space Shuttle Main Engine during a test firing at the John C. Stennis Space Center in Hancock County, Mississippi. Spacecraft propulsion is any method used to accelerate spacecraft and artificial satellites. Space propulsion or in-space propulsion exclusively deals with propulsion systems used in the vacuum of space and should not be confused with launch vehicles. Several methods, both pragmatic and hypothetical, have been developed each having its own drawbacks and advantages. Most satellites have simple reliable chemical thrusters (often monopropellant rockets) or resistojet rockets for orbital station-keeping and some use momentum wheels for attitude control. Soviet bloc satellites have used electric propulsion for decades, and newer Western geo-orbiting spacecraft are starting to use them for north-south station-keeping and orbit raising. Interplanetary vehicles mostly use chemical rockets as well, although a few have used Ion thrusters and Hall effect thrusters (two different types of electric propulsion) to great success. Artificial satellites must be launched into orbit after which they must be placed in their nominal orbit. Once in the desired orbit, they often need some form of attitude control so that they are correctly pointed with respect to the Earth, the Sun, and possibly some astronomical object of interest. They are also subject to drag from the thin atmosphere, so that to stay in orbit for a long period of time some form of propulsion is occasionally necessary to make small corrections (orbital station-keeping). Many satellites need to be moved from one orbit to another from time to time, and this also requires propulsion. A satellite's useful life is usually over once it has exhausted its ability to adjust its orbit. For interplanetary travel, a spacecraft must use its engines to leave Earth's orbit. Once it has done so, it must somehow make its way to its destination. Current interplanetary spacecraft do this with a series of short-term trajectory adjustments. In between these adjustments, the spacecraft simply moves along its trajectory with a constant velocity. The most fuel-efficient means to move from one circular orbit to another is with a Hohmann transfer orbit: the spacecraft begins in a roughly circular orbit around the Sun. A short period of thrust in the direction of motion accelerates or decelerates the spacecraft into an elliptical orbit around the Sun which is tangential to its previous orbit and also to the orbit of its destination. The spacecraft falls freely along this elliptical orbit until it reaches its destination, where another short period of thrust accelerates or decelerates it to match the orbit of its destination. Special methods such as aerobraking or aerocapture are sometimes used for this final orbital adjustment. 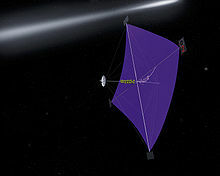 Some spacecraft propulsion methods such as solar sails provide very low but inexhaustible thrust; an interplanetary vehicle using one of these methods would follow a rather different trajectory, either constantly thrusting against its direction of motion in order to decrease its distance from the Sun or constantly thrusting along its direction of motion to increase its distance from the Sun. The concept has been successfully tested by the Japanese IKAROS solar sail spacecraft. 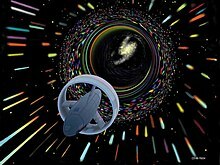 No spacecraft capable of short duration (compared to human lifetime) interstellar travel has yet been built, but many hypothetical designs have been discussed. Because interstellar distances are very great, a tremendous velocity is needed to get a spacecraft to its destination in a reasonable amount of time. Acquiring such a velocity on launch and getting rid of it on arrival remains a formidable challenge for spacecraft designers. When in space, the purpose of a propulsion system is to change the velocity, or v, of a spacecraft. Because this is more difficult for more massive spacecrafts, designers generally discuss spacecraft performance in amount of change in momentum per unit of propellant consumed also called specific impulse. Higher the specific impulse, better the efficiency. Ion propulsion engines have high specific impulse (~3000 s) and low thrust whereas chemical rockets like monopropellant or bipropellant rocket engines have a low specific impulse (~300 s) but high thrust. When launching a spacecraft from Earth, a propulsion method must overcome a higher gravitational pull to provide a positive net acceleration. In orbit, any additional impulse, even very tiny, will result in a change in the orbit path. The rate of change of velocity is called acceleration, and the rate of change of momentum is called force. To reach a given velocity, one can apply a small acceleration over a long period of time, or one can apply a large acceleration over a short time. Similarly, one can achieve a given impulse with a large force over a short time or a small force over a long time. This means that for manoeuvring in space, a propulsion method that produces tiny accelerations but runs for a long time can produce the same impulse as a propulsion method that produces large accelerations for a short time. When launching from a planet, tiny accelerations cannot overcome the planet's gravitational pull and so cannot be used. Earth's surface is situated fairly deep in a gravity well. The escape velocity required to get out of it is 11.2 kilometers/second. As human beings evolved in a gravitational field of 1g (9.8 m/s²), an ideal propulsion system would be one that provides a continuous acceleration of 1g (though human bodies can tolerate much larger accelerations over short periods). The occupants of a rocket or spaceship having such a propulsion system would be free from all the ill effects of free fall, such as nausea, muscular weakness, reduced sense of taste, or leaching of calcium from their bones. The law of conservation of momentum means that in order for a propulsion method to change the momentum of a space craft it must change the momentum of something else as well. A few designs take advantage of things like magnetic fields or light pressure in order to change the spacecraft's momentum, but in free space the rocket must bring along some mass to accelerate away in order to push itself forward. Such mass is called reaction mass. In order for a rocket to work, it needs two things: reaction mass and energy. The impulse provided by launching a particle of reaction mass having mass m at velocity v is mv. But this particle has kinetic energy mv²/2, which must come from somewhere. In a conventional solid, liquid, or hybrid rocket, the fuel is burned, providing the energy, and the reaction products are allowed to flow out the back, providing the reaction mass. In an ion thruster, electricity is used to accelerate ions out the back. Here some other source must provide the electrical energy (perhaps a solar panel or a nuclear reactor), whereas the ions provide the reaction mass. A rocket with a high exhaust velocity can achieve the same impulse with less reaction mass. However, the energy required for that impulse is proportional to the exhaust velocity, so that more mass-efficient engines require much more energy, and are typically less energy efficient. This is a problem if the engine is to provide a large amount of thrust. To generate a large amount of impulse per second, it must use a large amount of energy per second. So high-mass-efficient engines require enormous amounts of energy per second to produce high thrusts. As a result, most high-mass-efficient engine designs also provide lower thrust due to the unavailability of high amounts of energy. Propulsion methods can be classified based on their means of accelerating the reaction mass. There are also some special methods for launches, planetary arrivals, and landings. A reaction engine is an engine which provides propulsion by expelling reaction mass, in accordance with Newton's third law of motion. This law of motion is most commonly paraphrased as: "For every action there is an equal, and opposite, reaction". Examples include both duct engines and rocket engines, and more uncommon variations such as Hall effect thrusters, ion drives and mass drivers. Duct engines are obviously not used for space propulsion due to the lack of air; however some proposed spacecraft have these kinds of engines to assist takeoff and landing. is the gravitational acceleration at sea level. is comparable to ve, then there needs to be about twice as much fuel as combined payload and structure (which includes engines, fuel tanks, and so on). Beyond this, the growth is exponential; speeds much higher than the exhaust velocity require very high ratios of fuel mass to payload and structural mass. For a mission, for example, when launching from or landing on a planet, the effects of gravitational attraction and any atmospheric drag must be overcome by using fuel. It is typical to combine the effects of these and other effects into an effective mission delta-v. For example, a launch mission to low Earth orbit requires about 9.3–10 km/s delta-v. These mission delta-vs are typically numerically integrated on a computer. Some effects such as Oberth effect can only be significantly utilised by high thrust engines such as rockets; i.e., engines that can produce a high g-force (thrust per unit mass, equal to delta-v per unit time). This energy is not necessarily lost- some of it usually ends up as kinetic energy of the vehicle, and the rest is wasted in residual motion of the exhaust. Comparing the rocket equation (which shows how much energy ends up in the final vehicle) and the above equation (which shows the total energy required) shows that even with 100% engine efficiency, certainly not all energy supplied ends up in the vehicle - some of it, indeed usually most of it, ends up as kinetic energy of the exhaust. that minimises the overall energy used by the rocket. This comes to an exhaust velocity of about ⅔ of the mission delta-v (see the energy computed from the rocket equation). Drives with a specific impulse that is both high and fixed such as Ion thrusters have exhaust velocities that can be enormously higher than this ideal for many missions. if the exhaust velocity can be made to vary so that at each instant it is equal and opposite to the vehicle velocity then the absolute minimum energy usage is achieved. When this is achieved, the exhaust stops in space  and has no kinetic energy; and the propulsive efficiency is 100%- all the energy ends up in the vehicle (in principle such a drive would be 100% efficient, in practice there would be thermal losses from within the drive system and residual heat in the exhaust). However, in most cases this uses an impractical quantity of propellant, but is a useful theoretical consideration. Anyway, the vehicle has to move before the method can be applied. Some drives (such as VASIMR or electrodeless plasma thruster) actually can significantly vary their exhaust velocity. This can help reduce propellant usage or improve acceleration at different stages of the flight. However the best energetic performance and acceleration is still obtained when the exhaust velocity is close to the vehicle speed. Proposed ion and plasma drives usually have exhaust velocities enormously higher than that ideal (in the case of VASIMR the lowest quoted speed is around 15000 m/s compared to a mission delta-v from high Earth orbit to Mars of about 4000 m/s). It might be thought that adding power generation capacity is helpful, and although initially this can improve performance, this inevitably increases the weight of the power source, and eventually the mass of the power source and the associated engines and propellant dominates the weight of the vehicle, and then adding more power gives no significant improvement.
. Thus the latter should not be too large. =10 km/s and the speed of the rocket is 3 km/s, then the speed of a small amount of expended reaction mass changes from 3 km/s forwards to 7 km/s rearwards. Thus, although the energy required is 50 MJ per kg reaction mass, only 20 MJ is used for the increase in speed of the reaction mass. The remaining 30 MJ is the increase of the kinetic energy of the rocket and payload. Thus the specific energy gain of the rocket in any small time interval is the energy gain of the rocket including the remaining fuel, divided by its mass, where the energy gain is equal to the energy produced by the fuel minus the energy gain of the reaction mass. The larger the speed of the rocket, the smaller the energy gain of the reaction mass; if the rocket speed is more than half of the exhaust speed the reaction mass even loses energy on being expelled, to the benefit of the energy gain of the rocket; the larger the speed of the rocket, the larger the energy loss of the reaction mass. The formula is for the ideal case again, with no energy lost on heat, etc. The latter causes a reduction of thrust, so it is a disadvantage even when the objective is to lose energy (deceleration). = 4.5 km/s, corresponding to a fuel value of 10.1 MJ/kg. The actual fuel value is higher, but much of the energy is lost as waste heat in the exhaust that the nozzle was unable to extract. In the case of acceleration in a fixed direction, and starting from zero speed, and in the absence of other forces, this is 54.4% more than just the final kinetic energy of the payload. In this optimal case the initial mass is 4.92 times the final mass. These results apply for a fixed exhaust speed. Due to the Oberth effect and starting from a nonzero speed, the required potential energy needed from the propellant may be less than the increase in energy in the vehicle and payload. This can be the case when the reaction mass has a lower speed after being expelled than before – rockets are able to liberate some or all of the initial kinetic energy of the propellant. or less, the maneuver can not be carried out at all with this engine. the acceleration due to it. Thus the theoretically possible thrust per unit power is 2 divided by the specific impulse in m/s. The thrust efficiency is the actual thrust as percentage of this. = 16 km/s, takes 1.5 months. = 50 km/s, takes 5 months. should not be too large. ^ Assuming 100% energetic efficiency; 50% is more typical in practice. Observe that the more fuel-efficient engines can use far less fuel; their mass is almost negligible (relative to the mass of the payload and the engine itself) for some of the engines. However, note also that these require a large total amount of energy. For Earth launch, engines require a thrust to weight ratio of more than one. To do this with the ion or more theoretical electrical drives, the engine would have to be supplied with one to several gigawatts of power, equivalent to a major metropolitan generating station. From the table it can be seen that this is clearly impractical with current power sources. Alternative approaches include some forms of laser propulsion, where the reaction mass does not provide the energy required to accelerate it, with the energy instead being provided from an external laser or other beam-powered propulsion system. Small models of some of these concepts have flown, although the engineering problems are complex and the ground-based power systems are not a solved problem. Instead, a much smaller, less powerful generator may be included which will take much longer to generate the total energy needed. This lower power is only sufficient to accelerate a tiny amount of fuel per second, and would be insufficient for launching from Earth. However, over long periods in orbit where there is no friction, the velocity will be finally achieved. For example, it took the SMART-1 more than a year to reach the Moon, whereas with a chemical rocket it takes a few days. Because the ion drive needs much less fuel, the total launched mass is usually lower, which typically results in a lower overall cost, but the journey takes longer. Mission planning therefore frequently involves adjusting and choosing the propulsion system so as to minimise the total cost of the project, and can involve trading off launch costs and mission duration against payload fraction. Most rocket engines are internal combustion heat engines (although non combusting forms exist). Rocket engines generally produce a high temperature reaction mass, as a hot gas. This is achieved by combusting a solid, liquid or gaseous fuel with an oxidiser within a combustion chamber. The extremely hot gas is then allowed to escape through a high-expansion ratio nozzle. This bell-shaped nozzle is what gives a rocket engine its characteristic shape. The effect of the nozzle is to dramatically accelerate the mass, converting most of the thermal energy into kinetic energy. Exhaust speed reaching as high as 10 times the speed of sound at sea level are common. Rocket engines provide essentially the highest specific powers and high specific thrusts of any engine used for spacecraft propulsion. Ion propulsion rockets can heat a plasma or charged gas inside a magnetic bottle and release it via a magnetic nozzle, so that no solid matter need come in contact with the plasma. Of course, the machinery to do this is complex, but research into nuclear fusion has developed methods, some of which have been proposed to be used in propulsion systems, and some have been tested in a lab. See rocket engine for a listing of various kinds of rocket engines using different heating methods, including chemical, electrical, solar, and nuclear. Rather than relying on high temperature and fluid dynamics to accelerate the reaction mass to high speeds, there are a variety of methods that use electrostatic or electromagnetic forces to accelerate the reaction mass directly. Usually the reaction mass is a stream of ions. Such an engine typically uses electric power, first to ionize atoms, and then to create a voltage gradient to accelerate the ions to high exhaust velocities. The idea of electric propulsion dates back to 1906, when Robert Goddard considered the possibility in his personal notebook.Konstantin Tsiolkovsky published the idea in 1911. For these drives, at the highest exhaust speeds, energetic efficiency and thrust are all inversely proportional to exhaust velocity. Their very high exhaust velocity means they require huge amounts of energy and thus with practical power sources provide low thrust, but use hardly any fuel. For some missions, particularly reasonably close to the Sun, solar energy may be sufficient, and has very often been used, but for others further out or at higher power, nuclear energy is necessary; engines drawing their power from a nuclear source are called nuclear electric rockets. With any current source of electrical power, chemical, nuclear or solar, the maximum amount of power that can be generated limits the amount of thrust that can be produced to a small value. Power generation adds significant mass to the spacecraft, and ultimately the weight of the power source limits the performance of the vehicle. Current nuclear power generators are approximately half the weight of solar panels per watt of energy supplied, at terrestrial distances from the Sun. Chemical power generators are not used due to the far lower total available energy. Beamed power to the spacecraft shows some potential. 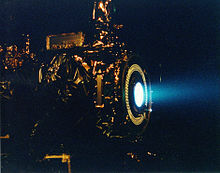 6 kW Hall thruster in operation at the NASA Jet Propulsion Laboratory. In electrothermal and electromagnetic thrusters, both ions and electrons are accelerated simultaneously, no neutralizer is required. 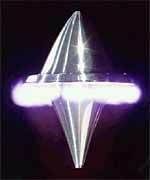 NASA study of a solar sail. The sail would be half a kilometer wide. There are several different space drives that need little or no reaction mass to function. A tether propulsion system employs a long cable with a high tensile strength to change a spacecraft's orbit, such as by interaction with a planet's magnetic field or through momentum exchange with another object. Solar sails rely on radiation pressure from electromagnetic energy, but they require a large collection surface to function effectively. The magnetic sail deflects charged particles from the solar wind with a magnetic field, thereby imparting momentum to the spacecraft. A variant is the mini-magnetospheric plasma propulsion system, which uses a small cloud of plasma held in a magnetic field to deflect the Sun's charged particles. An E-sail would use very thin and lightweight wires holding an electric charge to deflect these particles, and may have more controllable directionality. As a proof of concept, NanoSail-D became the first nanosatellite to orbit Earth. [full citation needed] There are plans to add them[clarification needed] to future Earth orbit satellites, enabling them to de-orbit and burn up once they are no longer needed. Cubesail will be the first mission to demonstrate solar sailing in low Earth orbit, and the first mission to demonstrate full three-axis attitude control of a solar sail. Japan also launched its own solar sail powered spacecraft IKAROS in May 2010. IKAROS successfully demonstrated propulsion and guidance and is still flying today. A satellite or other space vehicle is subject to the law of conservation of angular momentum, which constrains a body from a net change in angular velocity. Thus, for a vehicle to change its relative orientation without expending reaction mass, another part of the vehicle may rotate in the opposite direction. Non-conservative external forces, primarily gravitational and atmospheric, can contribute up to several degrees per day to angular momentum, so secondary systems are designed to "bleed off" undesired rotational energies built up over time. Accordingly, many spacecraft utilize reaction wheels or control moment gyroscopes to control orientation in space. A gravitational slingshot can carry a space probe onward to other destinations without the expense of reaction mass. By harnessing the gravitational energy of other celestial objects, the spacecraft can pick up kinetic energy. However, even more energy can be obtained from the gravity assist if rockets are used. Beam-powered propulsion is another method of propulsion without reaction mass. Beamed propulsion includes sails pushed by laser, microwave, or particle beams. A successful proof of concept Lightcraft test, a subset of beam-powered propulsion. Studies generally show that conventional air-breathing engines, such as ramjets or turbojets are basically too heavy (have too low a thrust/weight ratio) to give any significant performance improvement when installed on a launch vehicle itself. However, launch vehicles can be air launched from separate lift vehicles (e.g. B-29, Pegasus Rocket and White Knight) which do use such propulsion systems. Jet engines mounted on a launch rail could also be so used. Shcramjet - similar to a scramjet engine, however it takes advantage of shockwaves produced from the aircraft in the combustion chamber to assist in increasing overall efficiency. 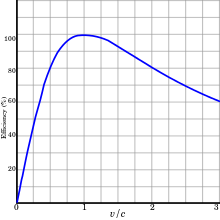 Normal rocket launch vehicles fly almost vertically before rolling over at an altitude of some tens of kilometers before burning sideways for orbit; this initial vertical climb wastes propellant but is optimal as it greatly reduces airdrag. Airbreathing engines burn propellant much more efficiently and this would permit a far flatter launch trajectory, the vehicles would typically fly approximately tangentially to Earth's surface until leaving the atmosphere then perform a rocket burn to bridge the final delta-v to orbital velocity. For spacecraft already in very low-orbit, air-breathing electric propulsion would use residual gases in the upper atmosphere as propellant. Air-breathing electric propulsion could make a new class of long-lived, low-orbiting missions feasible on Earth, Mars or Venus. When a vehicle is to enter orbit around its destination planet, or when it is to land, it must adjust its velocity. This can be done using all the methods listed above (provided they can generate a high enough thrust), but there are a few methods that can take advantage of planetary atmospheres and/or surfaces. Aerobraking allows a spacecraft to reduce the high point of an elliptical orbit by repeated brushes with the atmosphere at the low point of the orbit. This can save a considerable amount of fuel because it takes much less delta-V to enter an elliptical orbit compared to a low circular orbit. Because the braking is done over the course of many orbits, heating is comparatively minor, and a heat shield is not required. This has been done on several Mars missions such as Mars Global Surveyor, Mars Odyssey and Mars Reconnaissance Orbiter, and at least one Venus mission, Magellan. Aerocapture is a much more aggressive manoeuver, converting an incoming hyperbolic orbit to an elliptical orbit in one pass. This requires a heat shield and much trickier navigation, because it must be completed in one pass through the atmosphere, and unlike aerobraking no preview of the atmosphere is possible. If the intent is to remain in orbit, then at least one more propulsive maneuver is required after aerocapture—otherwise the low point of the resulting orbit will remain in the atmosphere, resulting in eventual re-entry. Aerocapture has not yet been tried on a planetary mission, but the re-entry skip by Zond 6 and Zond 7 upon lunar return were aerocapture maneuvers, because they turned a hyperbolic orbit into an elliptical orbit. On these missions, because there was no attempt to raise the perigee after the aerocapture, the resulting orbit still intersected the atmosphere, and re-entry occurred at the next perigee. A ballute is an inflatable drag device. Parachutes can land a probe on a planet or moon with an atmosphere, usually after the atmosphere has scrubbed off most of the velocity, using a heat shield. Airbags can soften the final landing. Lithobraking, or stopping by impacting the surface, is usually done by accident. However, it may be done deliberately with the probe expected to survive (see, for example, Deep Impact (spacecraft)), in which case very sturdy probes are required. Below is a summary of some of the more popular, proven technologies, followed by increasingly speculative methods. The fourth is the maximum delta-v this technique can give (without staging). For rocket-like propulsion systems this is a function of mass fraction and exhaust velocity. Mass fraction for rocket-like systems is usually limited by propulsion system weight and tankage weight. For a system to achieve this limit, typically the payload may need to be a negligible percentage of the vehicle, and so the practical limit on some systems can be much lower. Steam thruster ? ? ? ? 4: Component and/or Breadboard Laboratory Validated. Expected TRL 5 in 2019. Spacecraft propulsion systems are often first statically tested on Earth's surface, within the atmosphere but many systems require a vacuum chamber to test fully. Rockets are usually tested at a rocket engine test facility well away from habitation and other buildings for safety reasons. Ion drives are far less dangerous and require much less stringent safety, usually only a large-ish vacuum chamber is needed. Some systems cannot be adequately tested on the ground and test launches may be employed at a Rocket Launch Site. A NASA assessment of its Breakthrough Propulsion Physics Program divides such proposals into those that are non-viable for propulsion purposes, those that are of uncertain potential, and those that are not impossible according to current theories. ^ With things moving around in orbits and nothing staying still, the question may be quite reasonably asked, stationary relative to what? The answer is for the energy to be zero (and in the absence of gravity which complicates the issue somewhat), the exhaust must stop relative to the initial motion of the rocket before the engines were switched on. It is possible to do calculations from other reference frames, but consideration for the kinetic energy of the exhaust and propellant needs to be given. In Newtonian mechanics the initial position of the rocket is the centre of mass frame for the rocket/propellant/exhaust, and has the minimum energy of any frame. ^ Hess, M.; Martin, K. K.; Rachul, L. J. (February 7, 2002). "Thrusters Precisely Guide EO-1 Satellite in Space First". NASA. Archived from the original on 2007-12-06. Retrieved 2007-07-30. ^ Phillips, Tony (May 30, 2000). "Solar S'Mores". NASA. Archived from the original on June 19, 2000. Retrieved 2007-07-30. ^ Olsen, Carrie (September 21, 1995). "Hohmann Transfer & Plane Changes". NASA. Archived from the original on 2007-07-15. Retrieved 2007-07-30. ^ Staff (April 24, 2007). "Interplanetary Cruise". 2001 Mars Odyssey. NASA. Archived from the original on August 2, 2007. Retrieved 2007-07-30. ^ Doody, Dave (February 7, 2002). "Chapter 4. Interplanetary Trajectories". Basics of Space Flight. NASA JPL. Archived from the original on July 17, 2007. Retrieved 2007-07-30. ^ Hoffman, S. (August 20–22, 1984). "A comparison of aerobraking and aerocapture vehicles for interplanetary missions". AIAA and AAS, Astrodynamics Conference. Seattle, Washington: American Institute of Aeronautics and Astronautics. pp. 25 p. Archived from the original on September 27, 2007. Retrieved 2007-07-31. ^ Anonymous (2007). "Basic Facts on Cosmos 1 and Solar Sailing". The Planetary Society. Archived from the original on July 3, 2007. Retrieved 2007-07-26. ^ Rahls, Chuck (December 7, 2005). "Interstellar Spaceflight: Is It Possible?". Physorg.com. Retrieved 2007-07-31. ^ Zobel, Edward A. (2006). "Summary of Introductory Momentum Equations". Zona Land. Archived from the original on September 27, 2007. Retrieved 2007-08-02. ^ "Xenon Ion Propulsion System (XIPS) Thrusters" (PDF). L3 Technologies. Retrieved 16 March 2019. ^ "Chemical Bipropellant thruster family" (PDF). Ariane Group. Retrieved 16 March 2019. ^ a b Benson, Tom. "Guided Tours: Beginner's Guide to Rockets". NASA. Retrieved 2007-08-02. ^ Choueiri, Edgar Y. (2004). "A Critical History of Electric Propulsion: The First 50 Years (1906–1956)". Journal of Propulsion and Power. 20 (2): 193–203. CiteSeerX 10.1.1.573.8519. doi:10.2514/1.9245. ^ Drachlis, Dave (October 24, 2002). "NASA calls on industry, academia for in-space propulsion innovations". NASA. Archived from the original on December 6, 2007. Retrieved 2007-07-26. ^ "Space Vehicle Control". University of Surrey. Retrieved 8 August 2015. ^ King-Hele, Desmond (1987). Satellite orbits in an atmosphere: Theory and application. Springer. p. 6. ISBN 978-0-216-92252-5. ^ Tsiotras, P.; Shen, H.; Hall, C. D. (2001). "Satellite attitude control and power tracking with energy/momentum wheels" (PDF). Journal of Guidance, Control, and Dynamics. 43 (1): 23–34. Bibcode:2001JGCD...24...23T. CiteSeerX 10.1.1.486.3386. doi:10.2514/2.4705. ISSN 0731-5090. ^ Dykla, J. J.; Cacioppo, R.; Gangopadhyaya, A. (2004). "Gravitational slingshot". American Journal of Physics. 72 (5): 619–000. Bibcode:2004AmJPh..72..619D. doi:10.1119/1.1621032. ^ a b Anonymous (2006). "The Sabre Engine". Reaction Engines Ltd. Archived from the original on 2007-02-22. Retrieved 2007-07-26. ^ Harada, K.; Tanatsugu, N.; Sato, T. (1997). "Development Study on ATREX Engine". Acta Astronautica. 41 (12): 851–862. Bibcode:1997AcAau..41..851T. doi:10.1016/S0094-5765(97)00176-8. ^ "World-first firing of air-breathing electric thruster". Space Engineering & Technology. European Space Agency. 5 March 2018. Retrieved 7 March 2018. ^ Conceptual design of an air-breathing electric propulsion system. (PDF). 30th International Symposium on Space Technology and Science. 34th International Electric Propulsion Conference and 6th Nano-satellite Symposium. Hyogo-Kobe, Japan July 4, 2015. ^ a b "Chemical monopropellant thruster family" (PDF). Ariane Group. Retrieved 16 March 2019. ^ Hall effect thrusters have been used on Soviet/Russian satellites for decades. ^ "Operation Plumbbob". July 2003. Retrieved 2006-07-31. ^ Brownlee, Robert R. (June 2002). "Learning to Contain Underground Nuclear Explosions". Retrieved 2006-07-31. ^ Spider Water Extraction System. Honeybee Robotics. 2018. ^ Millis, Marc (June 3–5, 2005). "Assessing Potential Propulsion Breakthroughs" (PDF). New Trends in Astrodynamics and Applications II. Princeton, NJ.